Porsche has wasted no time in getting the open variant of its all-new 911 model to market; we only drove the coupe for the first time a matter of weeks ago and we’ve yet to drive that car. The Cabriolet first appeared in the 911 range back in the latter days of the SC model in the early 1980s, and has been a staple ever since – in fact, one in` three Porsches sold is an ‘open’ car. However, can the 992 offer the traditional appeal of a cabriolet without the inevitable compromises from chopping the roof off? While the 992 platform is entirely new, one carry over has been the 3-litre twin turbo flat six engine. Nevertheless, it too has seen considerable development, not least with the integration of an exhaust particulate filter. The turbochargers are now larger, with electronic control of their wastegates, while the intercoolers have been moved from the rear corners to the top of the engine, which is fed fuel via more responsive piezo injectors. In S guise it makes 444bhp with 391lb ft of torque, and that’s good enough for a 0-100kph time as low as 3.5 seconds with the Sport Plus mode (just 3.4 seconds in the 4S). More compact and lighter than the roof module in the 991 Cabriolet, thanks to the extensive use of magnesium and aluminum, the fully electric soft top opens and closes in just 12 seconds, and at speeds of up to 50kph. Porsche is particularly proud of how it maintains the roof profile of the coupe model, and almost matches that car for cabin refinement at speed. Behind the occupants’ heads is an electrically-operated wind deflector and a roll over protection structure that deploys automatically should the car detect you’re about to have an almighty accident. The roof module is fitted into an overall structure that boasts a much greater use of aluminium – now over 60% – and claims much greater structural rigidity. Nevertheless, a Cabriolet still weighs 70kg more than a coupe, a four-wheel drive model 50kg more than a rear-wheel drive car, and the 992, like-for-like, around 55kg more than a 991.2 model. Blame a heavier gearbox, the use of the wide-arch shell only, and the ever-growing list of equipment, gadgets and driver assistance systems for offsetting the dieting gains made elsewhere. That means a 4S Cabriolet PDK weighs a not inconsiderable 1,635kg. Once ensconced within the new sports seats the first obvious change is the new dial pack amid a much more stylised cabin, the mix of large central analogue rev counter and TFT secondary dials being particularly effective. Anther dead giveaway that you’re in a 992 is the truncated centre section of the bonnet which borders the scuttle; behind, the high sweep of the rear deck means the glass window is little more than a letterbox, and rearwards visibility is at times marginal. The roof lowers with a simple depress of a button on the centre console, and buffeting with it lowered is notably contained, even without raising the wind break. Out of the two cars, the four-wheel drive version will appeal to those looking for maximum surefootedness in all weathers, and for the best sprinting ability against the stop watch, but when it comes to feeling alive, like a real 911, it’s the rear-drive car all the way. The steering instantly feels lighter and cleaner, and the reduction in kerbweight seems noticeable, the car responding to the throttle more keenly. The full accelerative capability of the 992 Carrera S starts to make its presence felt, and it feels quick – really quick. 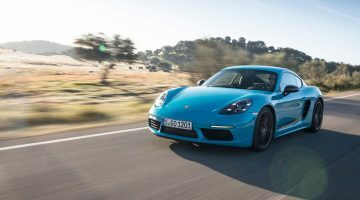 In fact, the new engine does have a voice, and switch on the optional sports exhaust, or simply use more throttle, and it finds it – from the outside it has hints of an old mechanically-injected 911 from the early ‘70s. With its 46mm wider front track and a quicker steering rack, plus rear-wheel steering and the active engine mounts, the cumulative effect in the 992 is that it’s possible to cover ground at an astonishingly rapid rate. You actually have to listen hard to pick up any messages that the car is rear-engined, the occasional wriggle in the 2S betraying where the main mass still lies. Traction out of corners is colossal, front end grip noticeably more confidence inspiring than any previous Carrera, while the brake pedal feel and the performance of the new setup is exemplary. It’s easy to overlook you’re in the Cabriolet if you’re driving quickly with the roof up, and only over the worst broken surfaces is there the slightest vibration through the bodyshell to suggest this isn’t the coupe. In that sense it’s a triumph. While the 911 Carrera still sits below the majority of its supercar opposition, it no longer feels like a more relatively affordable option in monetary terms. With the 2S starting at $136,705 (and the 4S from $143,767), the addition of some key dynamic options and a little personalisation means that a $166,000+ price tag is very easy to achieve. That surely puts the new Cabriolet head to head with any future Aston Martin Vantage Volante, as well as the new Audi R8 Spyder.